Don’t get left in the dark when it comes to safely viewing the solar eclipse! 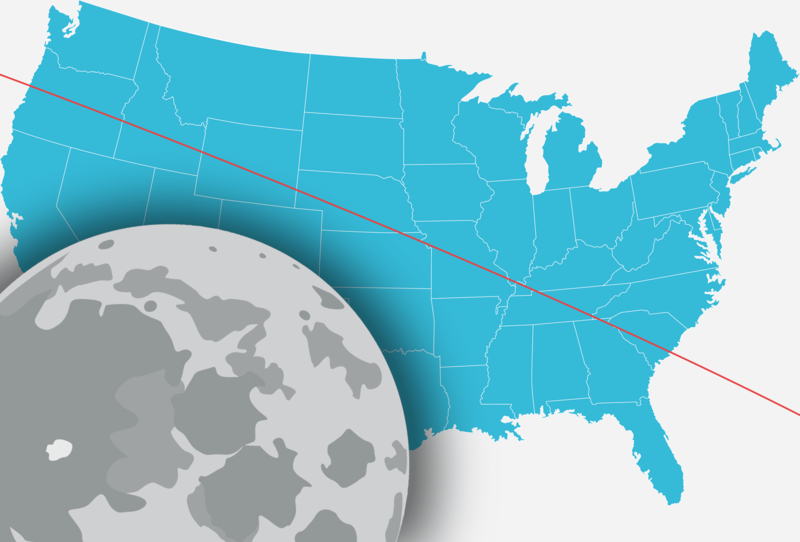 By now, you’ve probably heard about the total solar eclipse that will be crossing the country on August 21st. From Oregon to South Carolina, millions will get a front-row seat to one of the most breathtaking events Nature can offer. But it’s important to make sure you’re viewing it safely! How a solar eclipse works should be no surprise: the Earth, moon, and sun align in a way that leads to the moon blocking out at least part of the sun. Total solar eclipses aren’t necessarily rare, though they often appear over the ocean or other continents. During the eclipse, skies will grow darker as more of the sun is covered. Stars and planets may be more visible. You may see strange shadow effects as the sun actually catches mountains, craters, and other surface formations on the moon. Crescent-shaped patterns appear under trees as gaps between leaves act as pinhole viewers, as shown in this image to the right. The sky may get significantly darker once the eclipse reaches totality, or the point when the entire sun is blocked by the moon. Some animals may behave strangely, as though it is nighttime! When is it safe to watch the eclipse? Looking directly at an eclipse while any part of the sun is still exposed is just as dangerous as staring at the sun on a normal day. While the sun is partially eclipsed—either before or after the period of totality, or if you’re located outside the region where the sun will be totally eclipsed—the only safe way to watch it is with special solar filters that can shield your eyes from harmful amounts of sunlight. It may sound like a complicated piece of equipment, but they can be as simple as paper “eclipse glasses” with filtered lenses that you may have seen at convenience stores lately! In many cases, you can find eclipse glasses for as little as $1 per pair, and many places, such as science museums or your optometrist’s office, may even have pairs for free. Keep your glasses on at all times during partial eclipse, even when looking through a camera, telescope, binoculars, or any other optical device. If you wear eyeglasses, put your eclipse glasses on over your normal glasses. Remember to keep an eye on children using glasses or any other type of filter. If you’re within the path of totality, only remove your glasses during the period of totality—the few minutes that the moon completely blocks the sun. Be very careful to not view the sun when it is not in totality. Many people are traveling to the states in which one can view the eclipse. If you live in those states, be wary of an influx of cars and limit travel as much as possible.